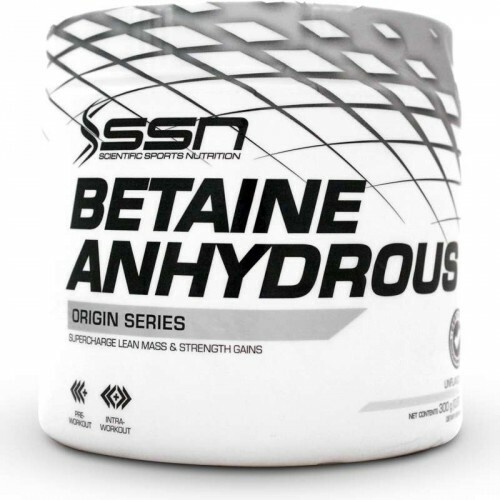 SSN Betaine Anhydrous supercharges lean mass and strength gains. Betaine’s main benefit comes from reducing homocysteine levels. High homocysteine levels can impair insulin signaling which then affects muscle protein synthesis. Muscle protein synthesis is responsible for increasing lean muscle mass. Humans studies have shown that a single dose of betaine reduces homocysteine levels. Betaine acts as an osmolyte which increases water retention of cells. Research suggests that optimal cellular hydration can increase the anabolic environment of the cells. Creatine has been proven to be effective at increasing strength and power in weight training athletes. Studies have shown betaine to assist the body in synthesizing creatine in skeletal muscle, therefore enhancing the effectiveness of creatine. A pilot study of 12 subjects taking 6 grams a day saw a 186% increase in nitric oxide (N.O.) levels after one week. N.O. plays a role in vasodilation which enhances blood-flow to optimise muscle repair and recovery. SSN Betaine Anhydrous is an ideal performance booster for athletes looking for a caffeine-free alternative. • One measured scoop (5g).